“A Taste of the NCC” presents nearly 500 delicious recipes from singers, alumni and friends of the National Christian Choir, packaged in a beautiful wide-spiral bound book which lays flat when open and folds back if desired. Covering a wide variety of food categories, this collection includes recipes for everything from appetizers to desserts: soups, salads, main dishes, veggies, breads and more. 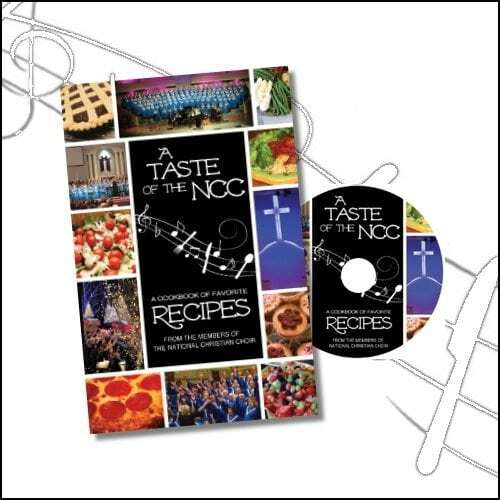 Along with this beautiful cookbook, “A Taste of the NCC,” you’ll receive a music CD with 14 selections by the Choir, NCC Pianist – Michael Faircloth, and NCC Director (and former pianist for the Choir) – Kathy Bowman. Listen as you cook or play the CD for your next dinner party!